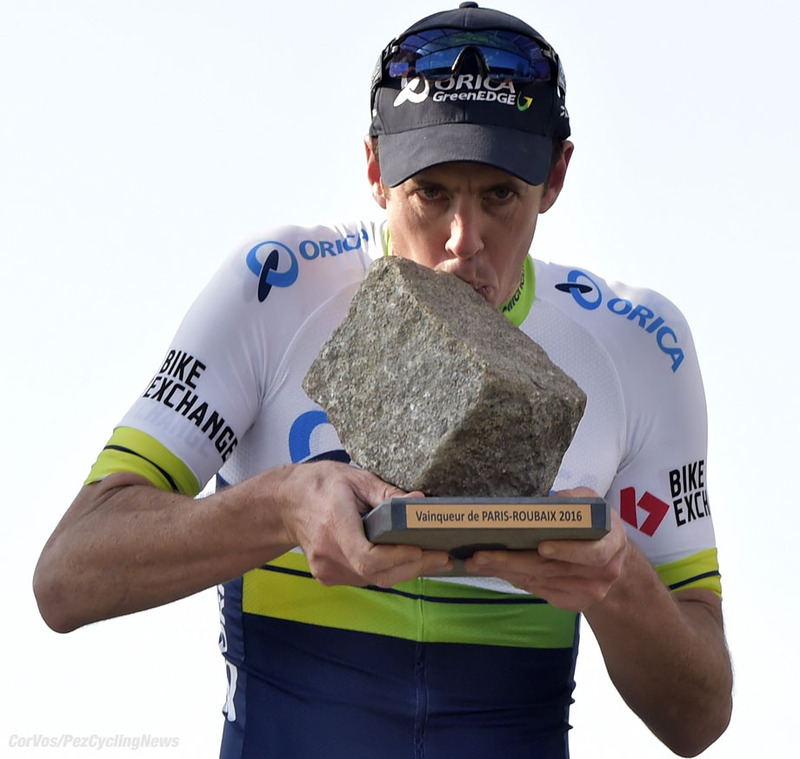 PezCycling News - What's Cool In Road Cycling : Mathew Hayman: 2016 Paris-Roubaix Winner! 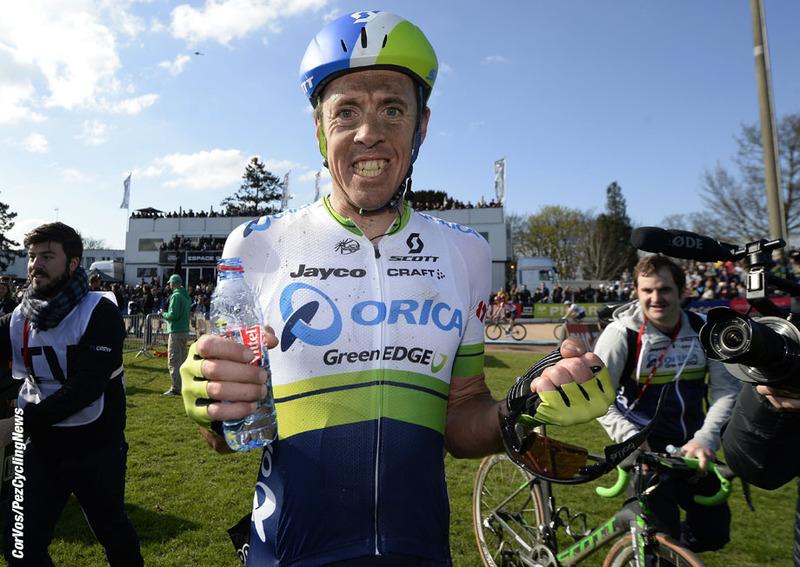 Mathew Hayman: 2016 Paris-Roubaix Winner! 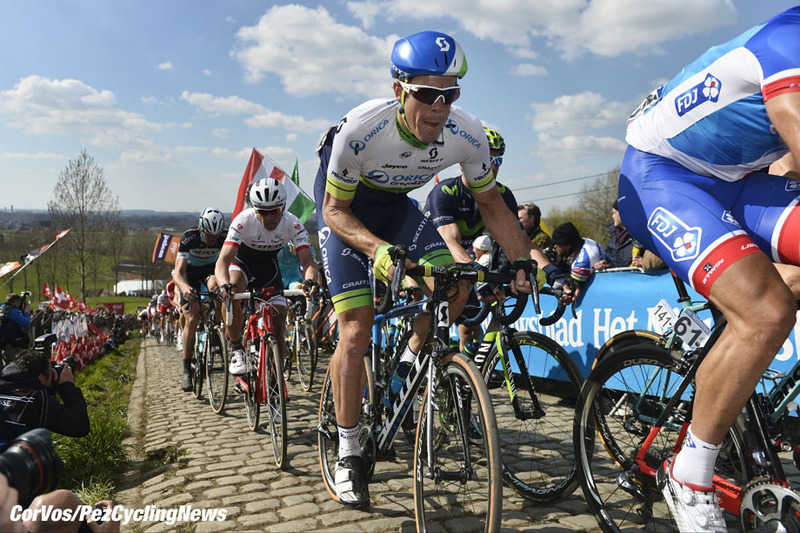 Rider Interview: The 2016 Paris-Roubaix saw Mathew Hayman out-sprint the retiring hero, Tom Boonen. Ed Hood managed to locate the Australian to hear from the horses mouth his thoughts as a winner on the cobbles of the 'Hell of the North'. I've been watching bike races for more than 45 years but I've never seen a better one than the 2016 Paris-Roubaix. Words like 'epic,' 'legendary,' and 'heroic' are tossed about with abandon in these hyperbolic days but on that Sunday they really were applicable. 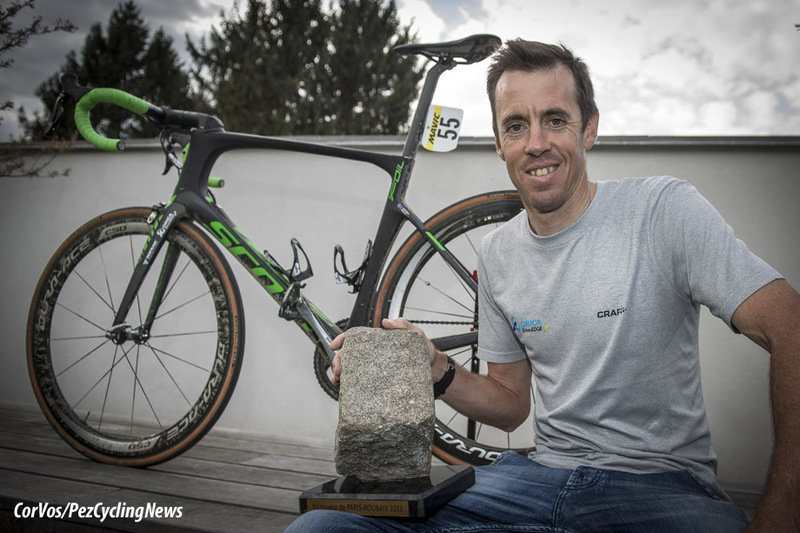 There was no doubt then that I felt excited on the Tuesday after the race when the race winner, 37 year-old war horse, professional since 2000, Australia's Mathew Hayman gave me some of his precious time to talk me through those six fabulous hours over the cobbles of Northern France. PEZ: An epic ride, Matthew - what was the team game plan for the race? Mathew Hayman: Jens Keukeleire (Belgium) was our lead rider; he was sixth last year and has been riding well in the Flemish races. 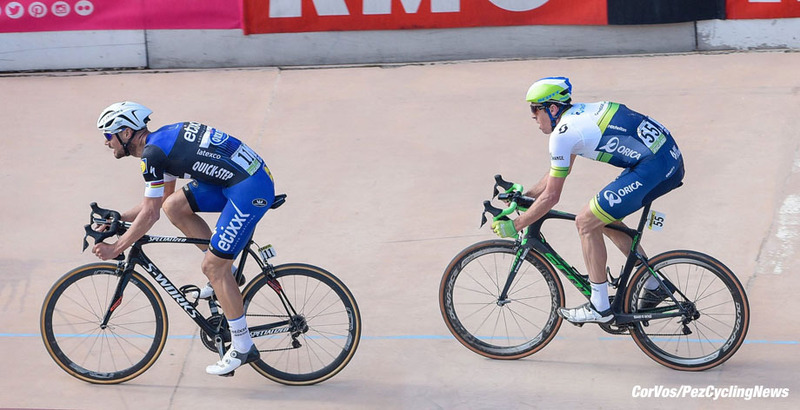 Luke Durbridge (Australia) too has been going well and was also a protected rider. I was an unknown quantity, coming back from injury (Hayman broke his arm at Het Nieuwsblad back in February, ed.) 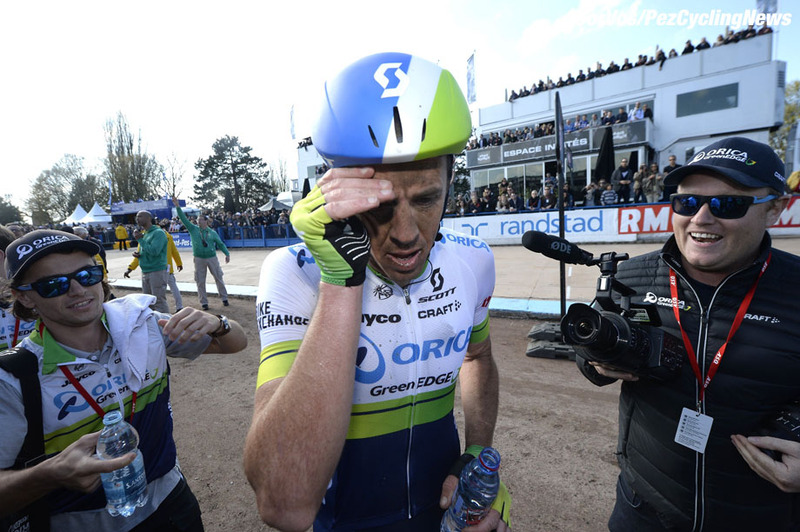 but I chatted with the team staff and said I felt like I was going well – albeit Paris-Roubaix is a six hour race and was unsure how I’d last the distance. They said I had carte blanche, but was there to help Jens if I could. 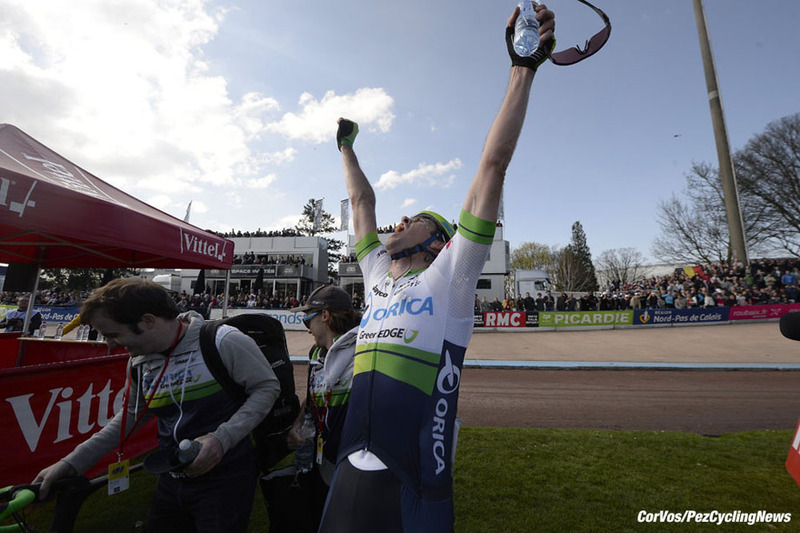 PEZ: Remind us how many Paris-Roubaix's have you ridden and what were your best previous finishes? That was my 15th attempt to get to the velodrome in Roubaix. When you first ride the race you realise that it's an epic endeavour and an achievement just to complete it, I don’t think there’s a rider who doesn’t breathe a sigh of relief when they turn on to that velodrome. I've finished eighth in 2012 and 10th in 2011 when riding with Sky. PEZ: And was 2016 the first year you had your freedom? No, not at all, I had the team at my service in the last two Paris-Roubaix I rode; I'm a domestique but this is an exceptional race which I have a lot of experience of in and my teams have been aware of that. 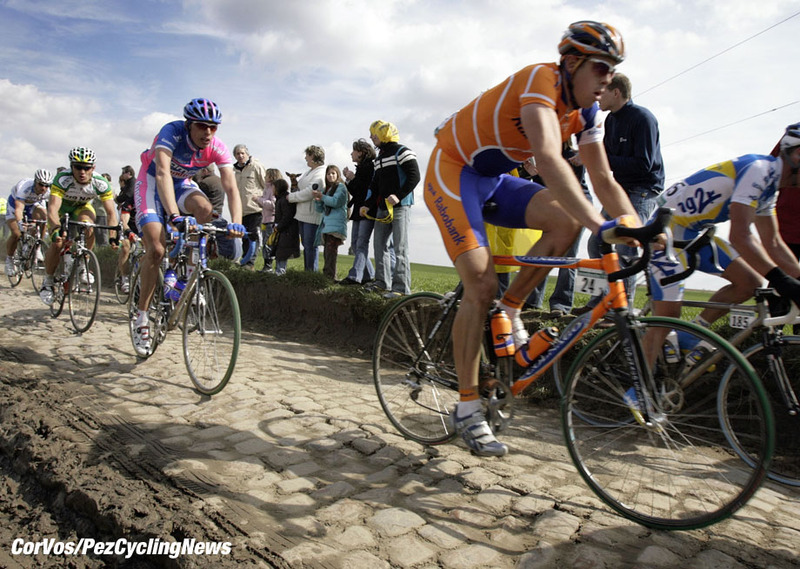 When I rode with Rabobank I rode it alongside men like Marc Wauters and Leon Van Bon - I learned so much from them. But perhaps because I had the pressure on the occasions I was protected it got to me - this time I came in to the race very relaxed. PEZ: And the inevitable question: What about the bike? I rode my usual Scott Foil, one layer of tape, 28 mil. Continental tubulars, Shimano Di 2 with 44/53 rings, I think. I came in relaxed and said; "I'll ride my usual bike, just blow the tires up!" In the past I've spent the weeks prior to the race testing equipment and debating with myself about what to ride - but not this time. . .
PEZ: How long were you 'up the road' on Sunday? We snuck away about 25K before the first secteur so that'd be about 75K in - the race is 256K. But of course, in the final I wasn't 'up the road' we were at the head of the race. I felt pretty good all day, comfortable, I was in the top 15 through every secteur so I didn't have big positioning fights. The big guys came up to us secteur 13 and Tom rode secteur 12 pretty hard so after that the size of the group was such that there wasn't a lot of fighting for position. I struggled in Camphine-en-Pevele and when Vanmarcke attacked I missed a corner in the Carrefour de l’Arbre and I knew from experience that it can be all over very quickly if you lose the wheel – but I rode steadily on the asphalt in the middle of that secteur and made my way back. PEZ: Over the years we’ve seen a few spectators cause problems, how was it for the 2016 edition? In years gone by some of them were all over the place, drunk – but maybe you notice that more if you’re off the back; when you’re at the front you’re just so focused and it’s not something I was conscious of this year. It’s strange though because you still identify friends beside the road, it’s like they’re frozen in a spotlight for a second and you can see exactly who it is that’s shouting your name. 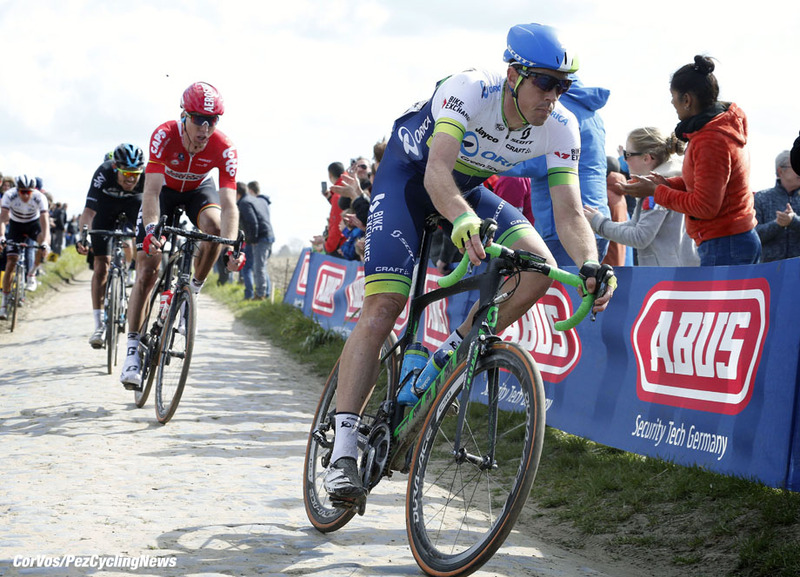 PEZ: Did you think it was slipping away when Vanmarcke went in the Carrefour? I was by far the underdog and at that stage I was thinking I’d be happy to get to the velodrome with them and it was up to the others to bring him back. PEZ: When it was down to just the five of you what were you thinking? I was surprised how aggressive it was through the Carrefour, I went to the front there and then whoosh, they came past me. Once we got through there and on the road to Roubaix and the velodrome I was worried someone might try to sneak away, especially on that long drag into town. I had a dig myself and didn’t feel too bad - I was strangely calm; from what I gather I was much calmer than my friends and family who were watching. I was happy, confident with nothing to lose – and having nothing to lose makes you dangerous. . .
PEZ: It must have been terrific to wheel on to that velodrome with Boonen? When I look back, it was fabulous but at the time I was concentrating too hard to take it in; I really didn’t want to be fourth or fifth, I wanted on the podium – I’d come so far and really wanted to be up there. I’ve done a bit of track racing and so knew to use the banking to my advantage, it may have looked like slow motion on the TV but I felt I kicked pretty hard. I could see there was a wheel coming and getting closer – but it wasn’t coming quick enough and it was only in the finish straight that I realised I was going to get it. PEZ: You looked shocked when you pulled up at the finish. I was, there’s no hiding it, it’s a race I love; anyone who knows me or has been around me knows how passionate I am about it. I’ve raced with men like Marc Wauters, Juan Antonio Flecha, and Leon Van Bon, who’ve been national champions and won Tour de France stages, but who’ve never won this race – I never dared to dream that I could. PEZ: Can you tell us about the celebrations? Before I talk about that I have to remind everyone that my team mate, Mitchell Docker had a really bad crash going into Arenberg Forest and was banged up pretty bad, ending up in hospital with facial injuries. We did celebrate but our thoughts were with Mitchell as we did so in a nice restaurant in Gent. We had a nice meal and a few drinks and it’s probably the only time since the win that things have felt normal. I speak Flemish and live in Belgium so the Media – TV, radio, newspapers and magazines - has been pretty full on. The locals where I live have been great, the street where we live was decked with streamers and there was a barbecue in the street outside my house. Normally I’d have done a couple of recovery rides, Monday and Tuesday; but I was back racing on the Wednesday in the Brabantse Pijl. I slept very little on Sunday night, thinking about the race, and Monday was just about the Media; Tuesday I went out for a ride and had a bit of pain where my arm was broken and had a bit of muscle pain. It was sore to start with in the race but after an hour or two it loosened off. PEZ: And finally, what’s the plan for the cobblestone? I’m sure I’ll find a nice spot for it – pride of place at home; but my friends and colleagues are happy to be looking at it and handling it. It’s funny though, imagine explaining to someone who’s not into the sport that your prize for all that effort is a rock on a piece of wood – still, beauty is in the eye of the beholder. . .